The conference is the culmination of a series of undergraduate workshops and creative writing seminars, advanced study seminars for graduate students and faculty, and performances by artists and poets honoring Anzaldúa this year as part of the campus’s 50th anniversary celebration. 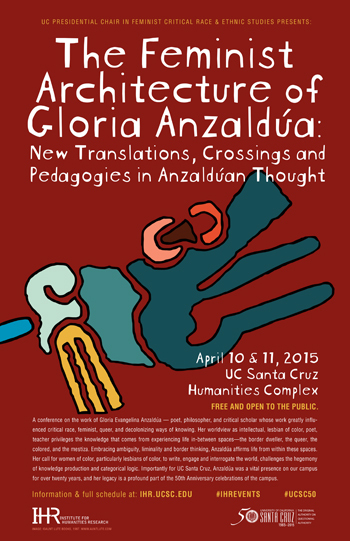 Titled The Feminist Architecture of Gloria E. Anzaldúa: New Translations, Crossings, and Pedagogies in Anzaldúan Thought, the two-day scholarly event is free and open to the public. Anzaldúa was a lecturer in the Women's Studies Department at UC Santa Cruz (now Feminist Studies), where she influenced a generation of students, offering such courses as Autohistorias and Women of Color in the United States, before her untimely death in 2004. 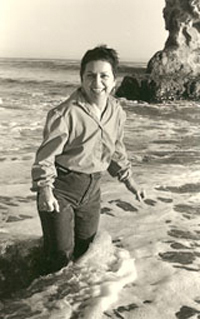 Anzaldúa was also a graduate student in literature at UCSC and had nearly completed her Ph.D. at the time of her death; she was awarded her Ph.D. posthumously. Anzaldúa drew inspiration from an array of altars she created in her home near Lighthouse Point. The altars form the heart of her archives, which now reside in McHenry Library’s Special Collections. She is the author of Borderlands: La Frontera (1987)--selected as one of the “100 Best Books of the Century” by both the Utne Reader and Hungry Mind Review. She also co-edited This Bridge Called My Back: Writings by Radical Women of Color (1981), a groundbreaking collection of essays and poems widely recognized by scholars in women’s studies as the premiere multicultural feminist text. Anzaldúa’s other published works include the anthologies Making Face, Making Soul/Haciendo Caras (1990), This Bridge We Call Home: Radical Visions for Transformation (2002), The Gloria Anzaldúa Reader (2009), as well as several children’s books. Anzaldúa’s numerous honors include a fiction award from the National Endowment for the Arts, the Before Columbus Foundation American Book Award, the Lamda Lesbian Small Book Press Award, the Susan Koppelman Award, the Smithsonian Notable Book Award, and the Américas Honor Award. For more information and the complete conference schedule, visit the Institute for Humanities Research web site.